Larry Correia knocks it out of the park yet again with his tale of war in a fantasy setting full of technology mingled with magic. For the first time I really enjoyed a story full of steampunk motifs and hard sci-fi based war. It appears that this story is set in a WarMachine, WarHammer, Iron Kingdoms miniature gaming setting. Normally this would not work for me, I took a look at some of the WarHammer books awhile back and they are not the type of book I would read. But Larry Correia has brought this type of story to a new level. Into the Storm is character driven with lots of insight into the drives and desires of the characters who are all doing their best to fight for what they believe in. Great stuff. The narration by Ray Porter is very good, his voice easily transitions from a gravely old man to a young soldier bringing all of the characters to life. I bought this audiobook on Audible and listened to it using the Audible app on my iPhone. The year is 606 AR, and Cygnar has been sorely pressed by its enemies both at home and abroad. In Caspia, the conflict with the Protectorate is about to erupt into full war with the looming invasion of Sul. The Cygnaran military is desperate for soldiers with the skill, strength, and bravery to take up the devastating galvanic weaponry of the new Storm Division. In this climate, every soldier is valuable, even those fallen from the honor expected of a Storm Knight. A group of such men – thieves, drunkards, and worse – comprise the Sixth Platoon. All they need is someone to lead them. Lieutenant Hugh Madigan, a peerless warrior knighted during the reign of deposed King Vinter IV, has spent years in obscurity, punished for his loyalty to the former king. Now he has been ordered back to the front and given command of the Sixth, his task to turn a platoon of miscreants into elite soldiers fit to be called Storm Knights. Time is short, and war is coming. One way or another, Lieutenant Madigan must lead his men into the storm…. ©2013 Privateer Press (P)2014 Audible Inc. 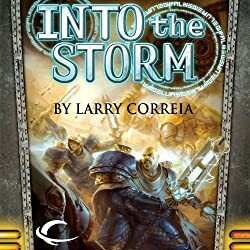 I rate Into the Storm an 8 out of 10 and recommend it to fans of books based on miniature gaming universes and anyone who needs a little more Larry Correia in their life. Everything works fine when the BeagleBone Black is connected to a computer via USB but when connected to the network via Ethernet it does not work. I ran into this issue when I first started using my BeagleBone Black out-of-the-box and again when I updated the OS to Debian. In a web browser open the Cloud9 IDE by going to http://192.168.7.2:3000/. You may be prompted to choose some settings, I like the defaults. Now you can unplug the BBB from USB and plug in an Ethernet cable and power adapter. 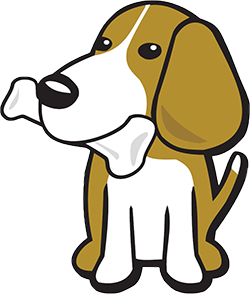 You should now be able to access the BBB from anywhere on your network using http://beaglebone.local or ssh beaglebone.log. This is normal as the RSA key has changed when you updated the OS. The easiest way to fix it is to run ssh-keygen -R then try connecting again. You should then be asked to add the new fingerprint to your "known hosts", say yes and you should then be asked for your Debian password who’s default is temppwd. And your in [email protected]:~$. After reading the Gray Man series of books I still had a desire for more spy action. In one of the review of Dead Eye Vince Flynn was mentioned so I looked him up and found the Mitch Rapp series. 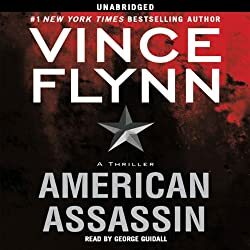 The first book in the series is American Assassin so I picked it up from Audible and gave it a listen. American Assassin is the first novel in the Mitch Rapp series written by Vince Flynn. This is a traditional superagent spy novel with more action than intrigue. I think it would make for a fantastic movie, especially if shot like the spy action-thriller movies of the 70’s. Mitch Rapp is a likable character with flaws that make him human. The narrator George Guidall is such an amazing talent. His style with this book is different from many of the other books I have listened to recently, instead of acting out the story it feels more like having someone reading a bedtime story. It has taken some adjusting, but I like it well enough. I look forward to listening to more Mitch Rapp novels. Before he was considered a CIA superagent, before he was thought of as a terrorist’s worst nightmare, and before he was both loathed and admired by the politicians on Capitol Hill, Mitch Rapp was a gifted college athlete without a care in the world… and then tragedy struck. Two decades of cutthroat, partisan politics has left the CIA and the country in an increasingly vulnerable position. Cold War veteran and CIA Operations Director Thomas Stansfield knows he must prepare his people for the next war. The rise of Islamic terrorism is coming, and it needs to be met abroad before it reaches America’s shores. Stansfield directs his protégé, Irene Kennedy, and his old Cold War colleague, Stan Hurley, to form a new group of clandestine operatives who will work outside the normal chain of commandmen who do not exist. Six months of intense training has prepared him to bring the war to the enemy’s doorstep, and he does so with brutal efficiency. Rapp starts in Istanbul, where he assassinates the Turkish arms dealer who sold the explosives used in the Pan Am attack. Rapp then moves onto Hamburg with his team and across Europe, leaving a trail of bodies. All roads lead to Beirut, though, and what Rapp doesnt know is that the enemy is aware of his existence and has prepared a trap. The hunter is about to become the hunted, and Rapp will need every ounce of skill and cunning if he is to survive the war-ravaged city and its various terrorist factions. I rate American Assassin a 7 out of 10 and recommend it to anyone looking for a spy adventure. This post is about installing Debian (BeagleBone Black – 2GB eMMC) 2014-03-27 and Flashing the eMMC using a Mac running OSX 10.9 Mavericks. I decided to get a head start on using Debian with the BBB which is soon to tbe the default OS installed on them. Holy Cow! The dialog box opening and closing gets really annoying to watch! WARNING: The SD card pokes out of the back of the BBB enough that it is easy to bump it and cause it to eject. Especially when plugging in a USB or HDML cable. It pays to be slow and patient when manipulating the BBB with an SD card in place. These academic things always have such ridiculously long titles <sigh>, the full title is " The Art of Conflict Management: Achieving Solutions for Life, Work, and Beyond ". I was looking for a non-fiction book to give a listen-to and I always give The Great Courses on Audible a look when searching for such a thing. I have listened to some of the Great Course lectures that I did not enjoy but a couple of them have been surprisingly good, so I am always willing to give them a try. At 12 hours and 20 minutes this is one of the shorter lectures in the Great Courses, and that is a good thing. This course get right to the point and does a good job of keeping on track. The amount of self referential babble is minimal compared to most other lectures. I do not understand the need to constantly tell the listener about what will be talked about in later lectures, it is distracting and counter productive. Professor Michael Dues does a great job presenting the material. I found his voice easy to listen to, easy to understand, and he kept my attention throughout the lectures. I enjoyed the way that multiple styles of conflict management were presented instead of trying to propose a one-size fits-all approach. 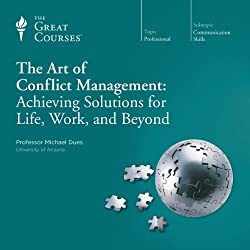 In 24 lectures brimming with practical tips, tools, and techniques everyone can use to better manage conflict in his or her professional and personal lives, gain the essential skills of conflict management. As presented by Professor Dues, these lectures will show you how to effectively deal with conflicts of all kinds, using the “win-win” model that has dominated the field for the past six decades. You’ll gain effective techniques for handling conflicts in your workplace, other organizational settings, or your personal life, whether you’re dealing with supervisors, coworkers, acquaintances, close friends, or family members. You’ll learn the best ways to analyze conflicts and work through the steps toward resolving them, including clarifying goals, handling difficult emotions, and negotiating agreements. And you’ll grasp the fundamental tricks of the trade that experienced negotiators have long used to deal with even the most seemingly intractable moral and cultural conflicts. While drawing on the latest groundbreaking research, Professor Dues has designed these lectures to be as practical as possible. Requiring no background in conflict management, negotiation, or psychology, they offer you not just knowledge, but strategies and tactics you can put to work in your own life right now. Best of all, you’ll be able to see those strategies and tactics in action through 70 professionally acted dramatizations that illustrate different conflict situations at home and in the workplace. You don’t have a choice about becoming involved in conflict. You do, however, have a choice about learning to manage it successfully by using the invaluable tools these lectures can give you. I rate The Art of Conflict Management a 7 out of 10 and recommend it to anyone looking to improve their conflict management skills. Posted in Audio, Books, Non-Fiction. I recently bought a BeagleBone Black (BBB) and am having a great time with it. I bought my BBB from Makershed as a part of a kit which included the book Getting Started with BeagleBone by Matt Richardson and a handful of electronic components. The kit is not bad, but I feel like it is overpriced, especially for someone who has a lot of components already. I also bought a power supply, a very cool case, and a wi-fi dongle from Amazon. I have been playing with Ardunio microcontrollers for awhile now and really like them. But they require that you program in their own C like language which I can muddle through but don’t really like. And it is not easy getting an Ardunio on a network, the code to make Ethernet, Wi-Fi, or Bluetooth to work doesn’t leave much space for your own ideas. The Rasberry Pi on the other hand just doesn’t speak to me. I am more interested in them now that I have spent some time with a BeagleBoard, but I still don’t think I have much of a use for a Rasberry Pi right now. In the coming weeks I will be posting more about the BeagleBone Black and the project I am working towards. 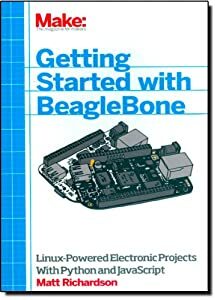 I ended up buying a Beagle Bone Black (BBB) from MakerShed in a kit that included some components and a paperback of Getting Started with BeagleBone. While waiting for the BBB to arrive I started reading the book on Safari Books Online and ended up never reading more than a couple of pages from the printed book. I was more comfortable reading the book on an iPad using the Safari Books Online app. This is a very good “Getting Started” book. Its purpose is to build familiarity and confidence for someone who has not used a BBB before, and it does that very well. So well that even before I was done with it I had a ton of plans for my BBB including updating the OS from Angstrom to Debian, adding an NTP server, and a lot more. Now I am planning on creating a remote home automation system for our garage doors. Many people think of Linux as a computer operating system, running on users’ desktops and powering servers. But Linux can also be found inside many consumer electronics devices. Whether they’re the brains of a cell phone, cable box, or exercise bike, embedded Linux systems blur the distinction between computer and device. Many makers love microcontroller platforms such as Arduino, but as the complexity increases in their projects, they need more power for applications, such as computer vision. The BeagleBone is an embedded Linux board for makers. It’s got built-in networking, many inputs and outputs, and a fast processor to handle demanding tasks. This book introduces you to both the original BeagleBone and the BeagleBone Black and gets you started with projects that take advantage of the board’s processing power and its ability to interface with the outside world. I rate Getting Started with BeagleBone a 10 out of 10 and recommend it to anyone as a first exposure to the BBB.